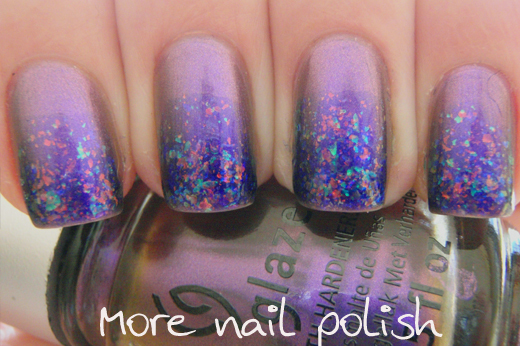 The next polish from the China Glaze Bohemian collection I tried was No Plain Jane. I wanted to fancy it up a bit rather than wear it as a straight mani, so I applied Cult Nails Clairvoyant from about 1/3 of the way down the nail, all the way to the tip. 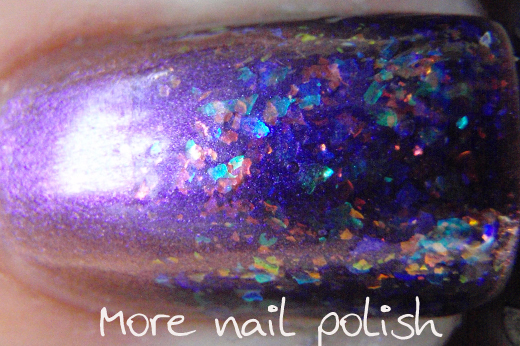 When that was dry, I put a second coat of Clairvoyant on just the last 1/3 of the nail. Some of these photos really show the tinted purple base in Clairvoyant, but mainly because my photos were picking up the bronzey colour shift in No Plain Jane. In real life the gradient was very smooth. None of these photos show the full colour shift, was was a bit weird, cause the base colour in No Plain Jane went bronze and the flakies in Clairvoyant went blue. 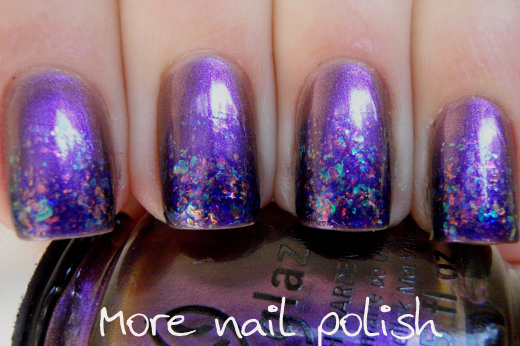 So while the main colours matched well, the duo chrome colour shift in both polishes actually clashed a bit. The tips were a bit thick and I did get some shrinkage with Seche Vite, but nothing too horrible. 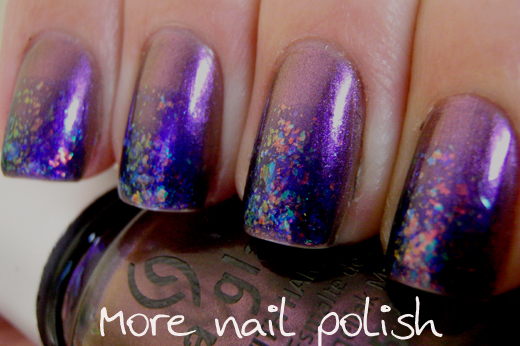 I like the idea of the flakies gradient, I will have to try it again. Wow. I love this! 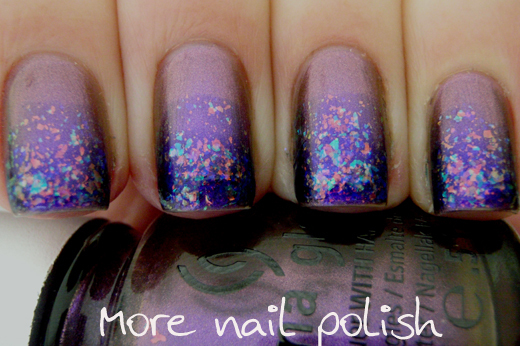 I'm a big fan of gradients and love doing them, but using a flakie never crossed my mind! This looks awesome! You are so good with gradients! Love what you did with this. I've been struggling with no plain Jane... I think you really accentuated the beauty of it. so cool, I really love that macro shot! that is really nice! if you don't mind, you may also submit a snippet of this review in our website. Wow, that does look really cool! Wanna try this one to! I'm gonna have to try this! Looks great. I need to try this! That's so amazing looking! 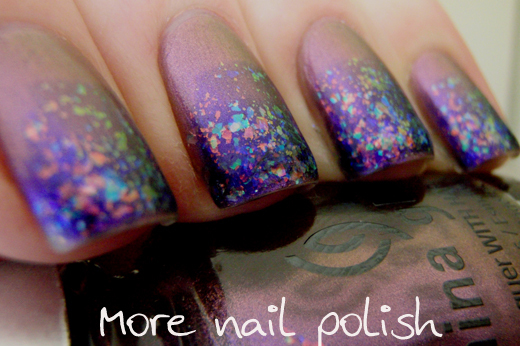 I will definitely try something like this with some of my flakies.